Remember my post a few months back about the Texas Book Blogger get together? (Click here if you haven't read it.) Long story short, we all got together and swapped books. The books that were left over were going to be donated some organization in Texas, we hadn't decided yet. Well I'm proud to say that today Jen and I took four sacks of books (over 60 books!) and donated them to the Austin Children's Shelter. I'm not sure what I was expecting from the Austin Children's Shelter, but what I saw when I arrived was not the picture in my head. The buildings were beautiful and brand new. They currently house over 50 kids who were either homeless, taken away from their parents, or have no one else to care for them. Janis, the Community Relations Director, gave us a quick tour and both Jen and myself were amazed. We were also glad that the kids already have a library! They were severely lacking in the young adult section, though so I'm so glad were were able to help them out a bit. I write to you to ask you all now for help. 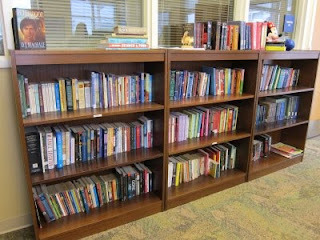 While we made a good donation today, they are still desperate for more YA books, particularly more current books. (Janis said they've read Harry Potter a lot and are dying for more Twilight-ish type books.) If you have books that you're willing to donate, please email me at StephanieNPellegrin@gmail.com. You can either mail them to me or if you live in Austin I can come pick them up. Most of the kids that live at the Austin Children's Shelter are aged 14-20 and are dying to read. They desperately need something to take them away from the life they're currently living, even if for just a while. They need to remember to dream again, and have hope again. I hope you can help me in making that possible. If you have books you want to donate but don't want to send them to me, I urge you to find an organization in your area that can put them to good use. All children should have the opportunity to read a good book. We need to have another get together to donate more books to them!! Such a great idea! I don't have any books (culled them pretty thoroughly when we moved to the US) but is there anything else they need? I have a box or two of books. What an awesome cause! I will be in Austin next weekend for my husband's book reading at BookPeople. I could definitely bring some books to give you! I actually just donated a large section of my collection for Christmas, otherwise I would be helping out more, sorry. This is an awesome idea! Will go through my books this week. saw this on Facebook post for the Austin Children's Shelter. I'll see what I can round up. Great Idea.